Current Gig: Professor of Psychology, University of Toledo. One word that best describes your work: Efficient. Computers and Accessories. I have two MacBook Pro laptop computers – one at home (a 13-inch), and one at my office (a 15-inch). I have them set up almost identically, in order for me to easily transition from one to the other. I use Dropbox (Pro version) for syncing all my files across devices, and for smooth transitions back and forth. I use the Safari web browser (syncing bookmarks and history across my devices), with the the 1Blocker app to decrease distractions from advertisements (and to improve page loading speeds, and prevent ad-based malware). I use the Bartender 2 app to decrease clutter in my menu bar – notice the slight difference in clutter in my screenshot. A theme here, from my work style, is an emphasis on consistency and easy transition; as well as minimizing clutter on my devices (but also around me), to decrease distraction. Mobile Devices. I use two smaller mobile devices. I use an iPhone 7 currently; when traveling or going out for the evening, I carry along the EasyAcc power bank, which is a small portable smartphone charger. I use an iPad Air for more convenient, lighter work (than a computer), and for use when traveling; along with the Logitech Keys-To-Go bluetooth keyboard. I use a Wacom stylus so that I have a smudge-free iPad experience. I have many work-related apps on my iPad, so that I can do almost everything on my iPad that I can do on my computer. I use the Safari mobile web browser, with the 1Blocker extension for ad-blocking. Notice the difference on my iPad between using 1Blocker (right) vs. not using it (left) – see screenshot. I have my iPhone and iPad set up very similarly, for easy transitions back and forth. I have my iPhone set up to receive selectively chosen, time-dependent push notifications that are important on my “communication pyramid” (e.g., instant messages, but not email), with no notifications on my iPad. 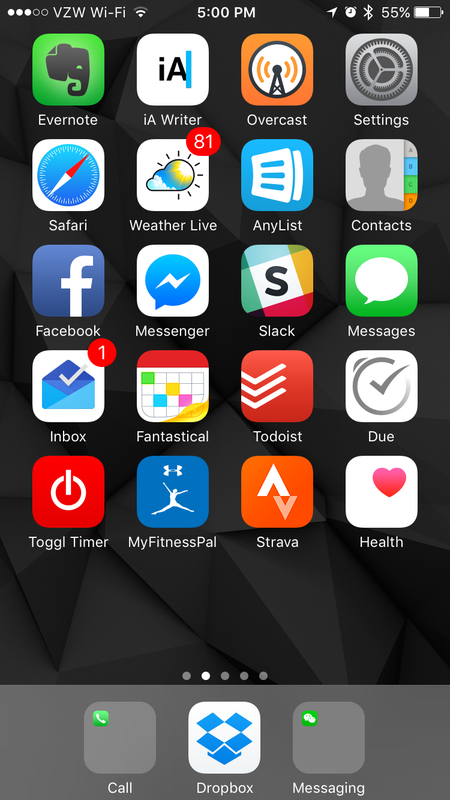 I use CGP Grey’s suggestions for setting up an iPhone home screen, with the most often used apps on the first home screen (within thumb’s reach) and folders on subsequent screens, and low-poly art background – here’s a recent screenshot of my homescreen. (Pro tip: For folders, keep only one app icon displayed on the first screen of a folder, and put the remaining apps on the second and subsequent screens of that folder. It makes for less perceived clutter across your home screens. See the bottom of my home screen). I wear an Apple Watch during nearly all waking hours, which prevents me from missing important notifications. I have it set up to only notify me of my most preferred, important notifications on my communication pyramid – about half of the notifications I receive on my iPhone (e.g., text messages, but not most social media messages). It also helps me save time from constantly unlocking and checking my phone for notifications. My watch screen shows me important information I’d want to know about, at a glance – here’s a screenshot. Productivity Services. For my personal email, I use Gmail – using the web-based interface on my computers. I have tons of labels in my account, so that I can stay organized by labeling particular types of emails for easily locating them later. On my iPhone/iPad, I use the the Inbox by Gmail app for snoozing my personal emails (for emails I have to take action on, but can’t act on them until a later pre-defined date), and easy swiping to archive messages (less frequently, I’ll use the Airmail email app for scheduling emails to be sent later, and for wider sharing options). For my work email, I use the Spark app on my devices. For email templates that I often use to respond to people, I use TextExpander. 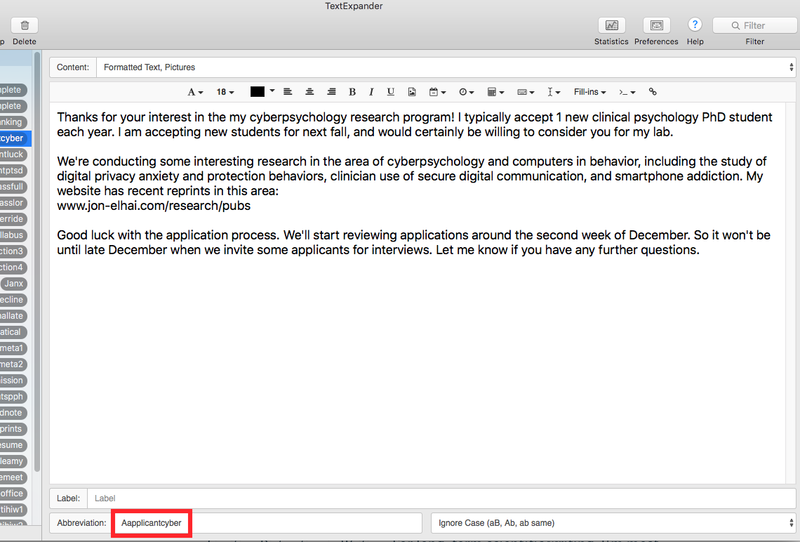 TextExpander lets me generate shortcuts for commonly used text that I need (e.g., template messaging responses) – for example, here’s a screenshot of a typical email response I send to prospective graduate applicants interested in my cyberpsychology lab – I just type “Aapplicantcyber” (red box at bottom) into my email compose screen, and this text template is automatically generated for me. I also use TextExpander on my iPhone and iPad, using a TextExpander keyboard. I deal with unsolicited and unwanted email by unsubscribing from all but the most essential emails I receive. For unwanted email that I am unable to unsubscribe from, I use many filters in my email accounts to auto-filter out/archive all the incoming mail that I don’t care about, saving me time from unnecessary reading. (see here for my detailed post about dealing with unwanted email). I use Shortwhale‘s email contact form for my website to further help keep my incoming email manageable. The goal is Inbox Zero, a productivity concept discussed by Merlin Mann. I use Google’s contacts feature, synced across all my devices. I use the Google Calendar service, in conjunction with the Fantastical app (for all my devices), for my calendars. Fantastical lets me use easy, natural language typing to schedule details of appointments (e.g., “Meet Jim tomorrow at 2pm at Starbucks on Maple Ave.” will accurately schedule the calendar appointment using the correct time and location). I use appointment reminders to keep me on track with my schedule. I use the x.ai virtual personal assistant, who schedules my meetings for me. I save time logging into web services and apps by using a password manager – I use 1Password for all of my usernames and passwords to get into my personal and work sites – across all my electronic devices. 1Password integrates into my iPhone/iPad share sheets in the Safari browser, so that I can easily input a password into my web browser without leaving Safari. For added security (though decreased convenience), I use two-factor authentication, with the Authy app. I use the Copied app on my iPhone, iPad and laptops to copy text from one device to another device of mine; it seems to work better than Apple’s Universal Clipboard. I use Slack for communication with my research lab on multiple projects. Slack helps achieve more efficient, shorter communication than email. For document sharing and collaboration, I use Google Drive for remote, simultaneous collaboration, to avoid back and forth, sequential emailing drafts of projects among teams. Recently I started tracking the time it takes me to complete work tasks. I’ve been using the Toggl app for that. Writing and Note Taking. On my phone, iPad and computer, I often use the iA Writer app for quick, plaintext notes and writing, with Dropbox integration for cloud syncing. I also use it for long-form, distraction-free writing, because it provides a clean (plaintext), minimalistic interface with no clutter from formatting buttons. Plaintext notes is my preferred way of writing, because plaintext is the most widely supported file format across devices. For long-form writing at the formatting stage, on my computers I use MS Word; I use Pages on my iPad (which is a great MS Word alternative). Pages doesn’t natively support a variety of fonts that may be used in documents that my students/collaborators share with me, so I use the AnyFont app to support additional fonts. Multitasking. I use the Magnet Mac app to multitask on my computers, by using side-by-side windows. This helps me view and manipulate several different apps simultaneously, without leaving an app to toggle to another one. I also find it important to know (and use) many keyboard shortcuts for common tasks, to speed up my work flow and switching from app to app. When people see me using my computer, they often state that they’re amazed at my speed and multitasking in computing; this is definitely a boost to productivity. Research. For conducting research, I use Feedly as an RSS reader to follow specific scientific journals in my research area. When locating research articles (or personal posts I find interesting), I use Pocket for saving these items to read later. I store, organize and retrieve my database of research articles in Endnote – I keep my Endnote database in my Dropbox account, so it syncs across my computers. Automation. I use several methods for automating tasks, to decrease the time I spend on specific tasks. I use IFTTT to create automated workflows for web services I use (e.g., I have an IFTTT recipe that automatically downloads Facebook photos in which I am tagged – to my Dropbox account). I use Workflow to automate specific routines needed on my phone (for example, I have a workflow that lets me log a weight training workout to Apple’s Health app with one click, rather than the six clicks otherwise needed). Travel. I travel often for business conferences, and for personal travel. I organize my travel itineraries with TripIt in conjunction with Google Calendar and iCal. TripIt allows forwarding email itineraries that TripIt automatically assembles into a travel itinerary, which can be auto-imported into Google Calendar or iCal. So the automation cuts down on my time manually entering itinerary information into my calendar. I have a TripIt Pro account which also provides me up-to-date gate and flight change notifications, as well as automatic seat upgrades. I use Todoist (discussed below) for organizing my packing list before traveling. I use TSA pre-check at the airport, to expedite my time spent in security screening. Limiting Distraction in Writing. For long-form scientific writing, I’m most effective when sitting in a coffee shop for a 3-5 hour writing session. I sometimes use the Forest app to motivate me to stay focused with my work; Forest provides a small disincentive for me to use my iPhone during my work session. With a 30-45 minute focused work session, I will subsequently take a short email and social media break. Music (below) also helps me limit distraction from my environment. I find that I do well with, and enjoy, writing in spurts. It’s not unusual for me to spend nearly an entire work week writing a paper from start to finish; and then do the same with a second paper the next week. Then I won’t write anything for a few months. Such a hiatus can recharge me to get ready to write another paper after the hiatus. For more on my writing process, see this other post of mine. Time Saving. I never use a scanner to scan documents, because too much time is wasted in getting the scan set up and processed. Instead, I use the Scanner Pro app to snap photos of documents from my phone, with good formatting and border detection, and sharing features. I use several separate, and non-overlapping sources to consume news and social media. As mentioned above, I use Feedly to follow scientific journal issue alerts. I use Twitter (with the Tweetbot app) to consume news media that I’m interested in. Tweetbot saves me time by saving my place in my timeline so I can pick up later from where I left off reading. I use Facebook to keep up with my friends. This approach keeps my media consumption/interaction separate based on different goals, and also decreases my time spent actively searching for information. 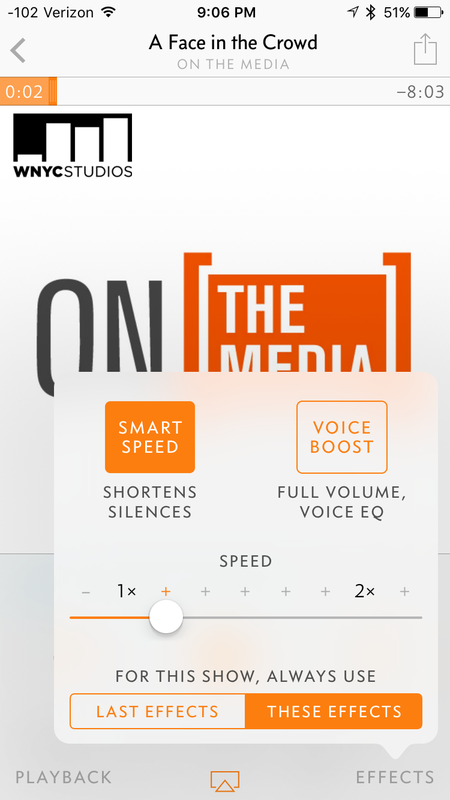 Finally, for podcasts, I use the Overcast app, which lets me save time by using Smart Sound (to cut silence between phrases) and Smart Speed (to speed up the audio at times needed) – see this screenshot from my phone. At my office, my MacBook rests on an mStand on my desk, to keep it elevated properly at eye level (it also prevents coffee spills on my computer). I type on an external, Apple Magic Keyboard placed on a keyboard shelf under my desk. I use a Wacom pen-tablet as a better, more ergonomic mouse alternative (though not pictured here). It provides me less discomfort when computing all day than when using a traditional mouse. I use an ergonomically-designed Steelcase Leap Chair. At home, I usually sit in an ergonomic reclining chair by Ekornes, with my MacBook which I set on top of a Slate mobile lap desk on my lap. How do you keep track of items on your to-do list(s)? I use the Due app for creating personal reminders that nag me every five minutes until I complete them. This helps me make sure to get tasks done, without neglecting them. For getting work-related (and home-related) project tasks done, I use Todoist across all my devices. Todoist is great for organizing my ideas, and the tasks associated with specific projects. It’s also great for keeping track of contexts or people associated with particular tasks/projects, so that I can view a particular person and see all the task I’m working on with the person so I can discuss them with him/her. Todoist is compatible with the Getting Things Done (GTD) time management method. And it has an open API, so I can use services such as IFTTT to connect other web services with it. I couldn’t live without my snowblower. If I had to shovel snow after each snowstorm in Ohio, my back would be in terrible pain. I also love my Aeropress, for making coffee. (for more on my coffee). I’m just better at time management that anyone I know. It takes me less time to complete a task than it takes other people. I’m focused on quality, but I am also good at judging when a task is complete, without obsessing over perfection. Using these productivity tips, as a routine, helps me – especially staying focused and limiting distraction. I find that listening to upbeat jazz music, as well as faster bluegrass, helps me to speed up my thought process and writing output. I only listen to instrumental music while working, because vocals would distract me. I prefer postbop, fusion, and new grass music; but also classical sometimes during more relaxed, mellow work. Music with syncopated rhythms especially gets my body moving to the beat (e.g., foot tapping) in a way conducive to active writing. I listen to Garaj Mahal a lot. And I really like using Apple Music. I usually listen to music through my Jabra on-ear, bluetooth headphones. Daily exercise (walking outside in my neighborhood, or on the treadmill while streaming TV shows), reading and browsing the web in the evenings (often with my kids), and travel. I believe it starts with the productivity habits that I discussed in this post. Keeping these habits helps me save time, allowing me to get my work done in a much shorter time-frame than I otherwise would. Most often, I work on weekdays starting anywhere between 9-11am (depending on whether I exercise on a given morning) and I mostly stop working at about 3pm. I usually take a 30-60 minute lunch break around the 12 o’clock or 1 o’clock hour. During my work hours, my kids are in school and my wife is at work. I’ll also often do work at other times when my family is preoccupied – while the kids are doing their homework, while my wife is helping my kids get ready for bed, etc. This type of schedule, coupled with my time-saving productivity habits mentioned above, lets me be satisfied with my work output, without working feverishly into the evenings or weekends. But without my productivity habits, I’d never be able to fit my work output into my work hours I mention here. This used to be different for me. When my kids were very young, and not in school yet, they attended day care/pre-school – most typically 3 days per week. My wife stayed home with them one day per week. And another day each week, I stayed home with them, to spend quality time with them during their early years. This required more creative time management on my part, having an entire weekday in which I was not doing work. I remember that in the evening on that one day a week, I would especially get back to work for several hours to compensate. I usually wind down around 10pm in the evenings. I go to bed around 11pm every night, and wake up at around 7am most days. It’s a pretty consistent routine, and helps me sleep well. I use the Sleep Cycle app to monitor my sleep, and for waking me when I am not in deep sleep. I use Apple’s Nightshift mode on all my devices to automatically modify their bright blue light emissions at night, to promote sleep using warmer colors. Don’t focus on becoming successful or accomplished in your career; just pursue what you enjoy most, and success will come as a natural byproduct. I credit some of the above techniques to CGP Grey, who is perhaps the most knowledge person about productivity and efficiency that I’ve ever heard of. Though from hearing Grey talk, it sounds like he often doesn’t practice what he preaches. 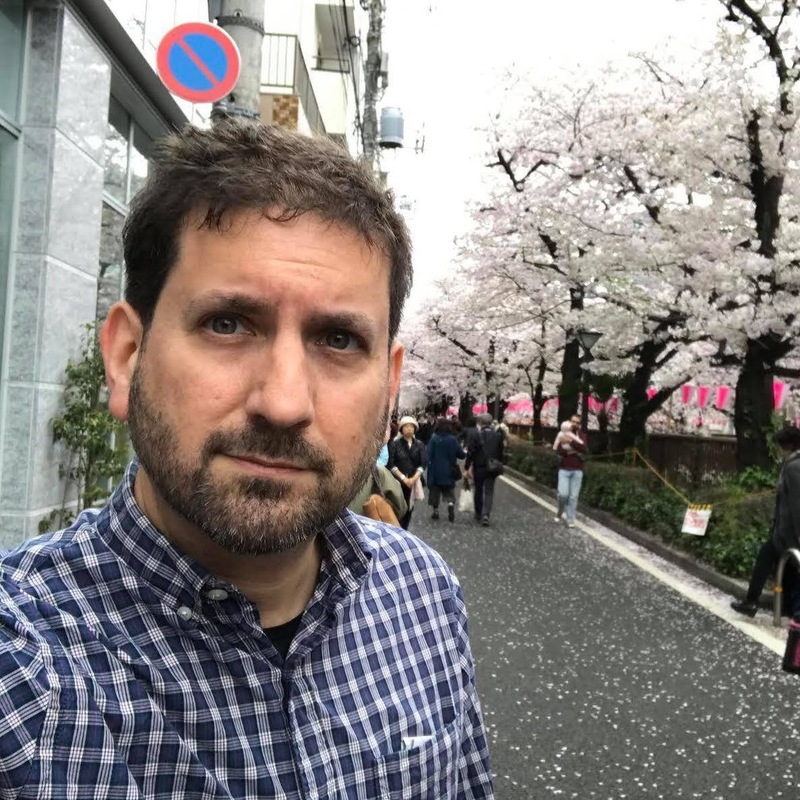 Grey’s productivity habits are comprehensively detailed through interviewing by Myke Hurley in the awesome Cortex podcast.